Today's topic is really important for bloggers who want to start their career in blogging or are beginners. 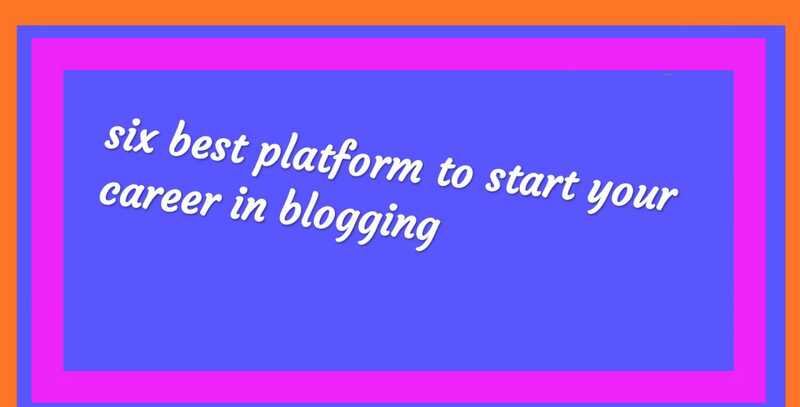 Are you a beginner​ & want to start career in blogging so it's first step is to decide most trusted blogging platform.before starting you should know about hosting & domain as in some blogging platform the hosting is free and you can use subdomain if you want to start blogging for free. Some of blogging platform you need to pay for hosting & domain both. So in this post we are going to discuss blogging platform in which some are absolutely free & some platform we need to pay for hosting & domain. Generally blogging means to share your knowledge or content which you are good in. It may be educational blog, cooking blog,event blog, business blog, fashion blog, jobs or news blog etc. Blogger.com- it is best & absolutely free platform to start your career in blogging. It's offers you a free SSL(Secure sockets layer) certificate for your blog or website either you are using blogspot.com or your own custom domain​ it's offers you free SSL certificate. The good thing about this blogging platform is that it is most trusted platform as it is a Google product. There are different templates & themes which you can use for your blog & can create free blog without paying a single money. Before starting making blog using blogger.com you must have little knowledge about html. Further you can also buy your own custom domain starting from 99rs-400rs from websites likeGodaddy & many more websites from where you can buy custom domain. But I recommend that you should buy custom domain as by using custom domain you can rank your website fast on search engine & you have full control over your content. In blogger.com you have less options like limited themes & less widgets. WordPress- this is the most trusted platform you can make free blog using this platform & lot of people build blog or website using this platform as it has a lot of features & themes which you can use to make your blog or website look nice. WordPress is based on content management (system) as you can easily make blog or website using this platform. It is easy to use it's uses drag & drop system which makes easy to use this platform for making blog or website. If you want to make a professional website using worpress.com than first you need to buy hosting & domain. The cheapest hosting you can buy is from Bluehost if you buy hosting from blueshost than you get a free domain along with it for one year. Blueshost.com provide cheapest price hosting & is trusted. You can also buy hosting from different websites ex- GoDaddy.com, HostGator etc. If you are willing to make a business or product selling website using WordPress than you need to first buy hosting & domain from the above given websites & have to install WordPress directly from where you have buy hosting & domain. Wix.com- it is the another easy to use platform for making blog for free. You need not to pay for making blog. But you can further select different plans for more plugins & widgets to make your blog look professional. If you make free blog using wix.com then you have limited themes & widgets. But if you uprgade or select various plans than you get a lot of options but you need to pay for that. Wix is easy to use & you can start making blog very easily using this platform. Joomla- it is the next another blogging or website making platform from where you can make blog. Further you can buy more features by upgrading. You need to pay for domain & hosting in joomla means you need a domain& hosting to use it. Joomla provides you different themes which you can use for your blog. For making blog or website using Joomla you need to first buy domain & hosting. Medium.com- it is also a good platform for making blog for free. It's trusted platform from where you can make blog it may be business blog, cooking blog etc. Most of the people start blogging with medium as it is easy to use & not need too much technical knowledge. Squarespace.com- to make blog or website using this platform you need to pay. There are different plans & upgrade but you can trial it free for 14 days after than you need to upgrade & have to pay for making blog or website using this platform. Before starting blogging you need to know about which platform will be good & trusted to start your career in blogging all you need to understand about what is hosting & domain. The person who writes a blog is known as blogger the blogs really are a great source of knowledge & helps to grow yourself. You can Also read Why you should start blogging?? So friends I hope that this post will help you all to start blogging easily.